Tyrells End house numbers, and whatever became of Rush Hill? 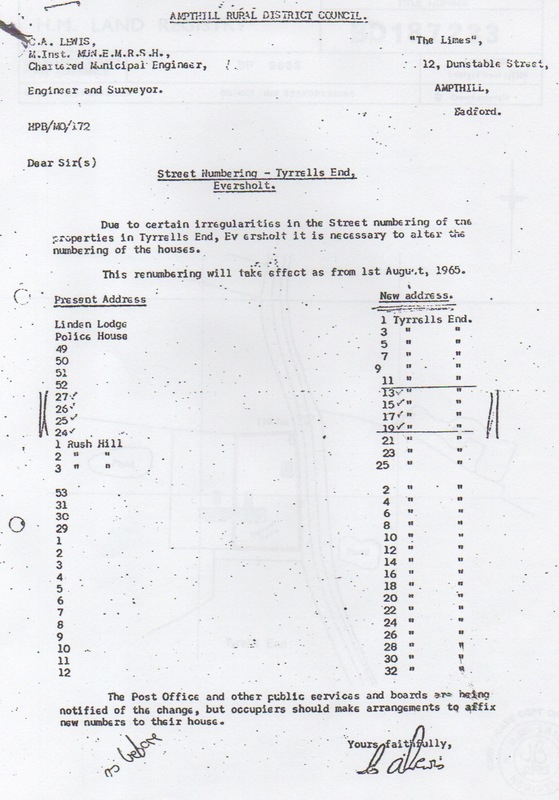 House numbers in Tyrells End were Reorganised by Ampthill Rural District Councill in 1965. The paper reproduced below (click for a bigger version) turned up in some house deeds. It shows that the old location of “Rush Hill”, once the northernmost part of Tyrells End, was eliminated, and all the houses became part of Tyrells End. 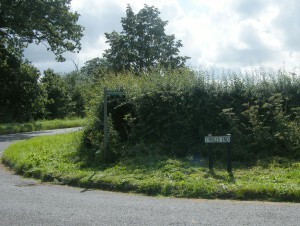 This issue resurfaced in 2002, when a “Rush Hill” street sign was reinstalled at the northern tee junction of Tyrells End. The matter was then discussed at a parish council meeting, when this document was produced and it was agreed that the sign was incorrect. It was replaced with a “Tyrells End” sign. 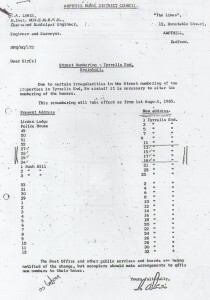 “Rush Hill” nowadays is the official house name of one of the houses in Tyrells End, but doesn’t appear on any current map as a recognised road or place name, and isn’t a road name in the Post Office database. “Rush Hill Baulk” was the unploughed strip between fields, back in the 1700s, according to the 1764 map. There’s no trace of any houses built in the area once known as “Rush Hill” until the Duke built the terrace cottages in 1913 that have been turned into the houses called “Rush Hill” and “Helford House” today. 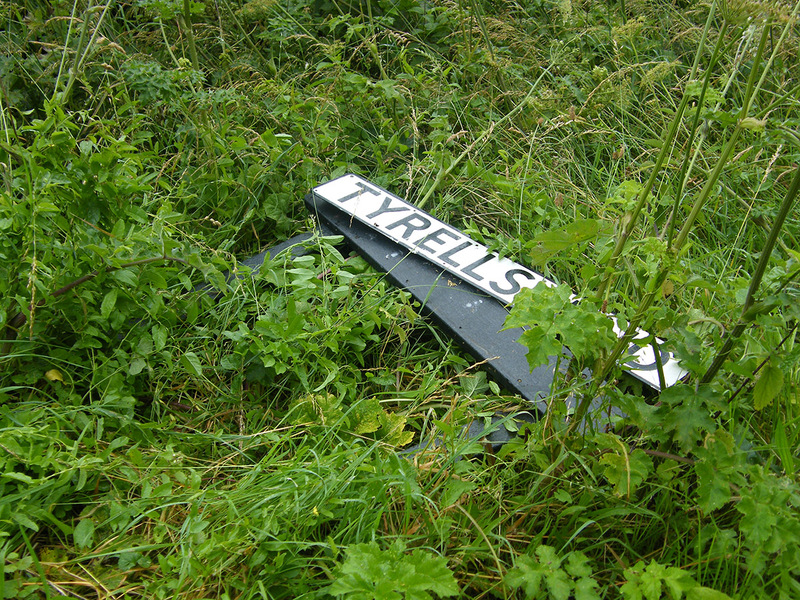 The spelling of “Tyrells End” has been, and continues to be, very variable! The current consensus seems to be “Tyrells”, with no apostrophe. The road sign eventually installed in 2002 lasted until July 2012, when someone appeared to drive into it. 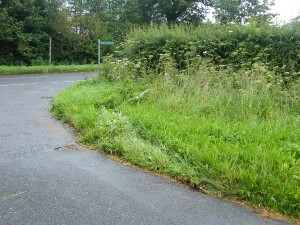 The pictures below were taken on 18 July 2012, and show tyre tracks leading onto the grass up to the road sign, and off again. There weren’t any skid marks and the tracks seemed too small for the tractor that is the usual culprit on Eversholt lanes, so goodness knows what went on.